Before I talk about this tart, funky cocktail, I need to say thank you to everyone for all the well-wishes on my last post. Just so much gratitude coming from this direction. Having everyone rooting for me felt like the best present ever. A million thanks with just as many exclamation points! Onward. This winter has already been an embarrassment of citrus riches for me. Earlier this fall, I helped Kate with a serious concord grape craving and took on the unwieldy mission of mailing grapes to Texas. She paid me back recently with some pretty Texas citrus, including a bunch of meyer lemons. Last year’s batch of preserved meyer lemons, which really might be my favorite ingredient ever, was getting dangerously low, so my first order of business was a big ol’ batch of preserved lemons. Last winter, I also experimented with a small batch of meyer limoncello for the first time. This perfectionist wasn’t 100% happy with the results, but it has definitely improved as it has aged and–hey!–it still seems to be disappearing at a steady clip. 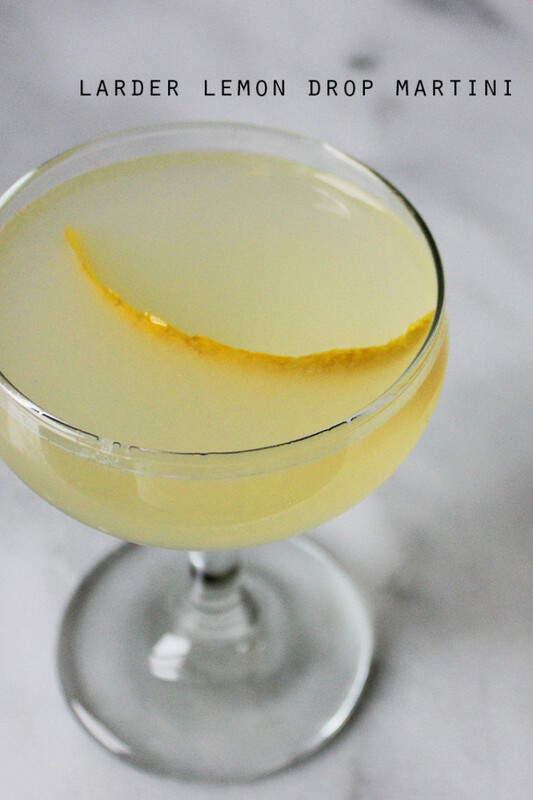 I love the challenge of creating an unexpected take on a ubiquitous cocktail like the lemon drop martini and my meyer limoncello was a great starting point. To that, I added a bunch a fresh meyer lemon juice, a bit of dry vermouth (it is a martini, after all), some vodka, and–trust me on this–just a little a preserved meyer lemon brine. The result is a tart, salty, and unexpectedly savory martini. 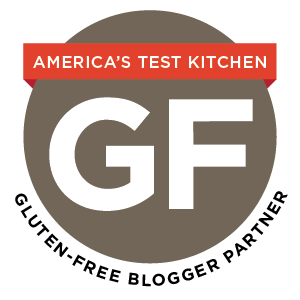 Plus, it’s a great opportunity to show off your pantry prowess. Cheers to a lemony-bright new year! 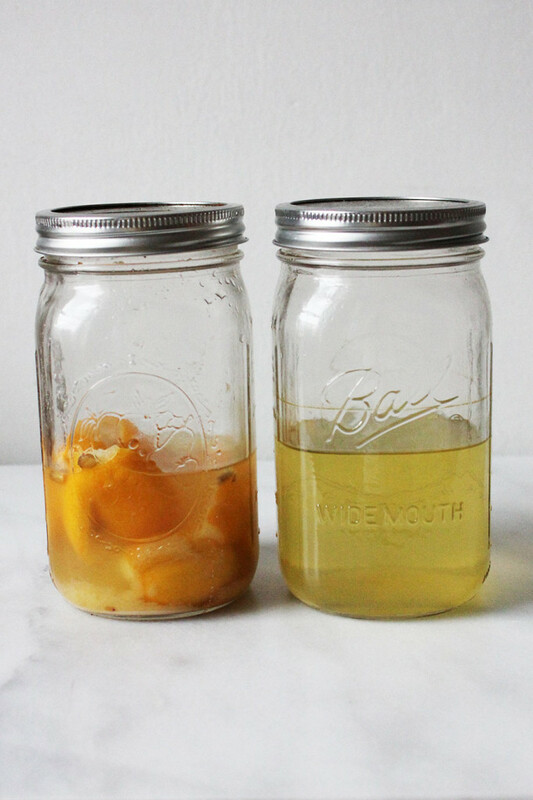 Add the juice, brine, limoncello, vodka, and vermouth to a cocktail shaker. Fill the cocktail shaker with ice. Shake until well-chilled, about 20 seconds. Strain into a coupe glass and garnish with meyer lemon peel if desired. I also like the preserved lemon brine cocktail ideas from Eating from the Ground Up and A Gardener’s Table. This is such a neat flavour!! I love it! Mmm, lemon drop martinis are my fave! Love this version. And I missed your last post, but I hope you are in full recovery (or well on your way there!) and enjoying everything the holidays have to offer. Hugs! Steve gifted me with preserved lemons last year and they were one of the most delightful food-gifts I’ve ever received. I love the idea of taking their unique flavor and making a deceptively savory yet dainty-looking cocktail. I assumed this would go in the other direction entirely, but props to you for your cocktail trickery! Also, now I just want to go to the farmers market and buy meyer lemons… and blood oranges. WHY DID I LEAVE THE CITY?! This sounds really lovely. I worship Meyer lemons and am lucky enough to have several of the big beauties on my counter — now I know what to do with them! Wow that sounds like my kind of drink!